Modified from a recipe received from a friend, this fruit dish is similar to a bread pudding — and very popular with our guests. 4 slices bread — Cubed. We use 4-5 slices of maple cinnamon bread, but cinnamon raisin works well also. Place cubed bread in large mixing bowl. Add melted butter and stir until butter is absorbed. Beat egg in separate bowl, add sugar and beat until thick. Add crushed pineapple (NOT drained) and pour over bread mixture and mix Pour into 11×7 in. baking pan. Bake 45 minutes at 350 degrees F until brown around sides. Spoon into individual servings (at Brewster House, we use champagne glasses with stems). 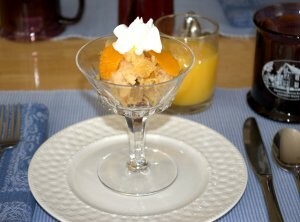 Garnish with 3-4 mandarin orange slices and a small amount of whipped cream, and serve warm. If this makes more than you need, you can freeze the excess and warm it up for another time.